Surely by no coincidence, the recent remastered re-release of nine of Led Zeppelin’s albums comes in time with this scarf collaboration with UK designer Paul Smith. 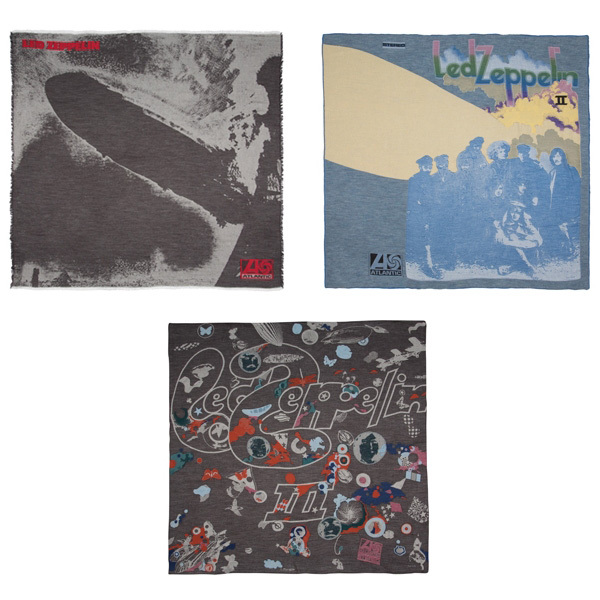 The highly limited-edition scarves each measure 1.5 x 1.5m, the first three being the covers for the Led Zeppelin, Led Zeppelin II and Led Zeppelin III albums. The first was created using an intricate photographic weaving technique where red detail was later added in with a fine fil coupe yarn. Led Zeppelin II was created differently, considering the range of colors, so four different yarns were interwoven carefully to accurately recreate the colorful design. Led Zeppelin III, on the other hand, was made from combining the contrasts of boucle and merino wool. Images haven’t yet been released for the other scarves, but word has it that both Led Zeppelin IV and Houses of the Holy were created using a jacquard-weaving technique. 50 of each design will be available at Paul Smith in London, only, as of October 23rd. So you’ll have to knit a stairway to England if you expect to get one.